Busy weekend for me with a friends birthday and Australia day coming up. This is a recipe I put together/modified last year, it’s a bit fiddly (the gluten free version is more so) to make but always a hit when served. Both the gluten free and regular recipe are below but the photo’s are from my latest batch of gluten free one’s. Feel free to sub my Potato and Rice flour mix for an off the shelf SF raising and plain gluten free flour. The gluten free version of the recipe below was assembled for a friend who’s also corn intolerant. Add the Brown sugar to the butter and mix in then add the Coconut and mix in. Add both plain and self raising flour (or Rice and Potatoe Flour with guar gum mixed through) and mix in well (ensure no lumps). The mix will be dryish but should stick together. Loosely spoon the above mix into the 24 depressions in a Mini Muffin Tin (grease tin if not non-stick or silicon) each depression should be filled neatly to the top. Grab something with a flat end which is round and approximately 25 mm across (potatoe peeler end or wooden spoon) and push this into the middle of each of the mini muffin pan depressions, rock the object as you push down to help compact the sides. The mix should compact on the bottom and push into the sides firmly but the top edge will be ragged and untidy. 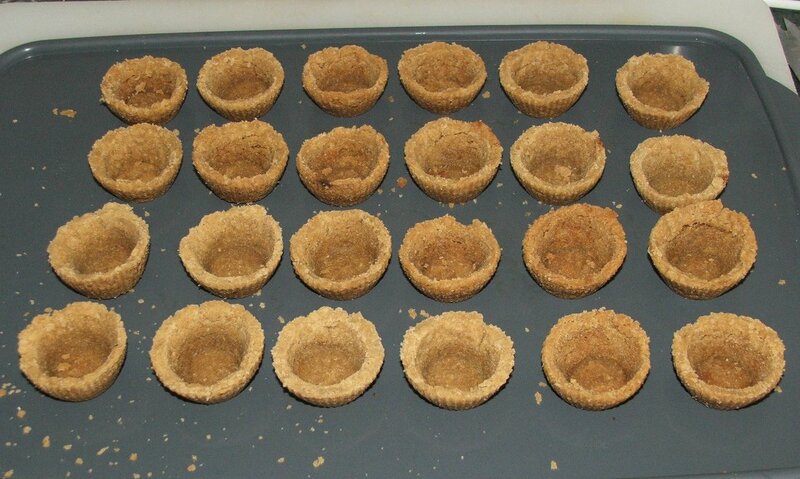 Using your fingers level of the mixture with the top of the mini muffin pan (this is fiddly and time consuming) to make a neat edge. 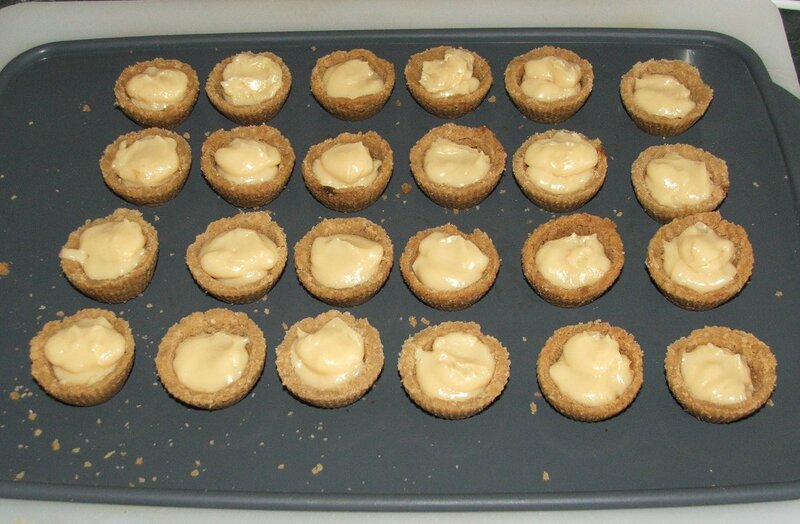 If you can see the bottom of the tin through the bottom of any cup add a little mix to the bottom and compact softly. Aim for a cup thats 1.5 to 2mm thick. Place the Cups into the Oven for approximately 5mins and watch them. They will expand and slowly fill the muffin depression. When you see this grab them out of the oven and push the sides and base back down using the wrong end of a butter knife or your wooden tool, so they are back into shape. Place back into the oven and watch again repeat the above if they deform, they will take approximatly 15-20mins to cook. Keep this up until the shells turn a golden brown (The gluten free ones don’t brown very much) then remove from oven and using your knife end or wooden tool push shells back into shape for the last time. Leave to cool for at least 20mins. Carefully turn the muffin pan upside down and bang (Wooden spoon) or pop/lift (if using a silicon tray) the shells out of the muffin pan and leave upside down on another tray to cool fully. As they cool the cups will harden. If your making the gluten free one’s do not bang or jar the shells they are a very fragile it’s best to make them in silicon bakeware and simply lift them out when they are cool or fill them with caramel and then lift them out. In the below picture you can see the mixture has been compacted in and is ready to go in the oven, the object in the top left of the picture is what I use to compact the mixture into the muffin pan, a short piece of 25mm dowl. I make my caramel in the microwave in a large rice cooker but you could use a microwave safe bowl with high sides. A word of warning caramel gets very hot (hotter than boiling water 150-200C) and can easily cause 2nd degree burns if you drop any on yourself while cooking it or spooning it into the cups. I have a nice 20 cent sized burn scar on my left hand where I got careless one day and some dripped on me. Don’t let anyone (or pet) lick the bowl until it’s well cooled. Add the can of sweetened condensed milk and mix in well. Warning with the following steps you must watch when microwaving and if you see the mix boiling over stop microwave immediately and stir the mixture. You’ll see it coming up the sides of the bowl. Microwave mix on high for 1 min remove and stir. Microwave mix on high for 1 min remove and stir. Microwave mix on high for 1 min remove and stir. Microwave mix on high for 1 min remove and stir. Microwave mix on high for 30secs remove and stir. Microwave mix on high for 30secs remove and stir. Microwave mix on high for 30secs remove and stir. After the above it should be nearly thick enough if not microwave for another min and stir repeat until it thickens. The caramel when at the right stage will be just a little runnier than whipped cream. When you stir the mix it will take 15-20 secs to settle back to a level surface. You can’t over thicken the caramel but if it’s to runny the caramel will make a mess when people eat them. Once your happy with the consistency of the caramel grab your tray with your 22-26 cups on it and flip the cups up the correct way. 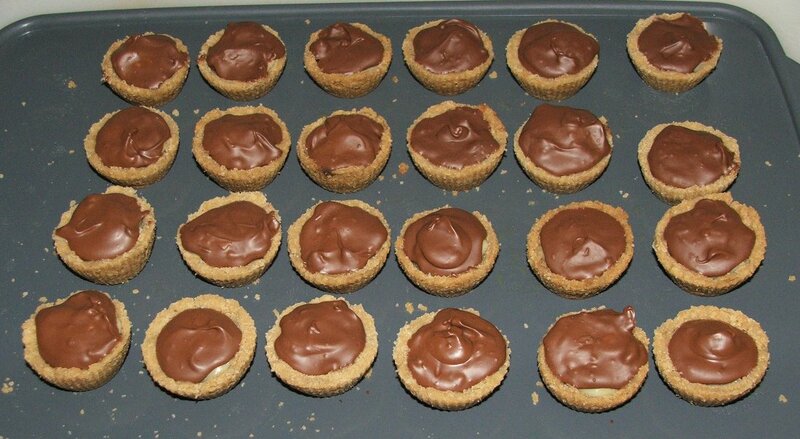 Using a large teaspoon/small desert spoon, spoon the caramel into the cups each cup will take 1-2 spoonfuls. I usually fill each cup to almost full then come back and top them up with any left over caramel. The caramel will hopefully end up with a peak in the middle just above the level of the cup wall. 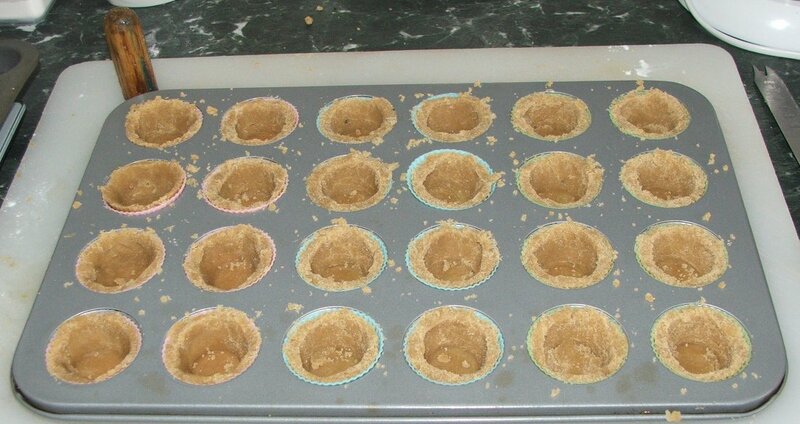 Leave the cups with caramel in them to cool fully. 3-4 hours in the fridge works best, but if your pushed for time 1 hour int he fridge works. 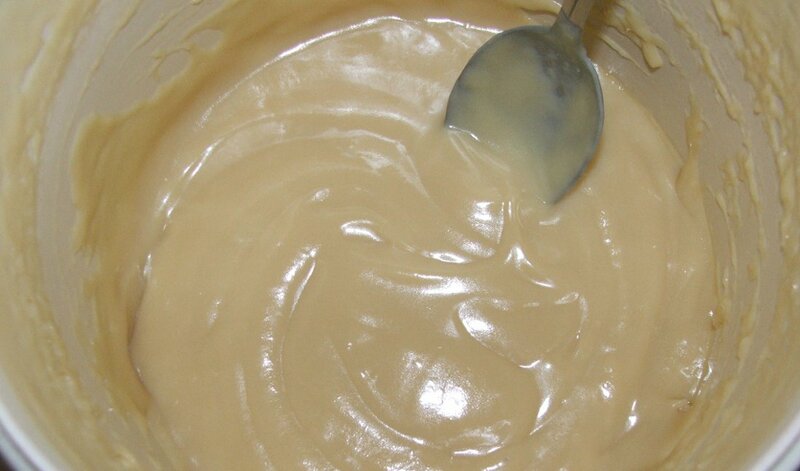 Below is a picture of my Caramel after it’s thickened, you can clearly see the stirring marks in the surface. For the gluten free ones you’ll have to locate gluten free chocolate (not to hard). I’ve topped with cooking chocolate and regular chocolate. If you use regular chocolate melt it more carefully as it burns easier and it’ll take longer to re-set. Melt the Dark or Milk chocolate. I do this in the microwave in a small bowl with about 30grams of the chocolate each time 30-40 secs on high is all that’s needed. It’s better to under melt the chocolate, stir and then do another 5 seconds than over melt and burn the chocolate. put them back into the fridge until the chocolate has set. 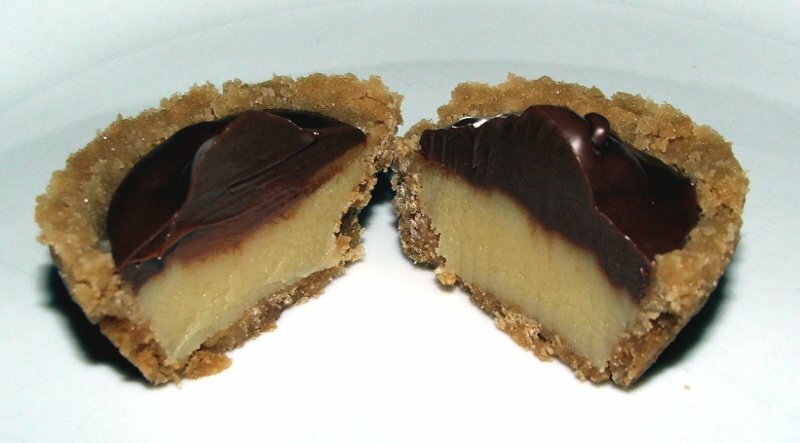 Once set the caramel cups can be eaten straight away, refrigerated and saved for later or frozen for a short time and used later on. Okay sometimes you just don’t have the time to make the cups if this is the case grab a shallow rectangular tin approximately 25cmx15cmx3cm (line with baking paper for quick removal). Push the base into the bottom of the pan extending it a little up the sides and bake, then spread the caramel on top allow to cool for bit then spread the chocolate on top, leave to cool in fridge, lift it out of the tin and cut into squares.